Today, the NASCAR Xfinity Series will take the green at Texas Motor Speedway. 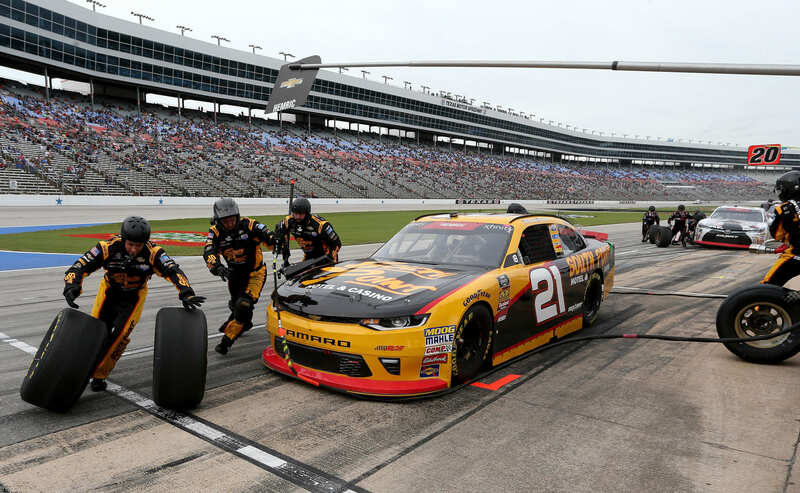 The O’Reilly Auto Parts 300 is a 200-lap event at the 1.44-mile race track in Fort Worth, Texas. View full 2018 Texas Xfinity race results below. Christopher Bell and Shane Lee will lead them to the starting line. Bell is planing to run this race in conservation mode. He just needs to finish to make it to Miami. Green flag, they run even at the line and nose to nose into turn one. Christopher Bell is around in front of the field! He slides up the banking but keeps it out of the wall. He just lost it on his own. The caution is out. Green, Cole Custer gives a push to Shane Lee on the inside. Tyler Reddick is hanging on the outside off turn two. Still side by side through turns three and four. Lee drives is deep to the bottom back in turn one. He slides up the hill and takes the spot. Lap 7, Lee cooks turn one. He slides up the hill again. Reddick cuts to the bottom at corner exit and drives under him. Reddick takes the lead into turn three. Lap 15, the caution is out for debris. There’s grass scattered on the race track after Bobby Earnhardt went agricultural racing. Green, Reddick has a huge push from Hemric. Reddick leads into turn one, Hemric takes over 2nd. Ryan Sieg and Ryan Truex run door to door into turn one just ahead of Christopher Bell. Seig gets loose on the bottom. The backend steps out and he skates up the hill. That pushes Truex into the wall and the caution is out. That was a battle for 10th. The caution is back out. Green, Reddick selected the outside lane. That doesn’t work. Daniel Hemric takes the lead on the bottom into turn one. Lap 33, Custer is on the bumper of Reddick. He takes a really narrow entry into turn one. That’s not to move under Reddick, that’s just to get some air on his nose. Reddick runs wide off turn two. Custer drives by on the bottom and takes 2nd away. Danoel Hemric takes the win in stage 1 of the Xfinity Series race at Texas Motor Speedway! The field heads to the pit lane. Hemric is first in and first off. Green flag on stage two, Reddick noses ahead on the outside lane. Hemric falls to 4th and now they’re going by him on the bottom. Christopher Bell is four wide and in the middle heading into turn three. Bell has cracked the top 10 after the pole sitter spun on lap 1. Lap 75, Cole Custer is running down the leader in a hurry. Lap 81, lap cars run side by side. Reddick has to lift as Custer pulls right to his bumper. Reddick gets into the lap car of Gase heading into turn one. Gase spins and the caution is out. Several cars head for the pit lane. Christopher Bell wins that race off the pit lane. Multiple cars stayed out on the track. Green, Custer and Reddick run side by side into turn one. 5 to go in stage 2, Justin Allgaier has a run on both of them. They look to make it three wide, Custer blocks. Custer wins the battle on the bottom. Allgaier moves to 2nd. 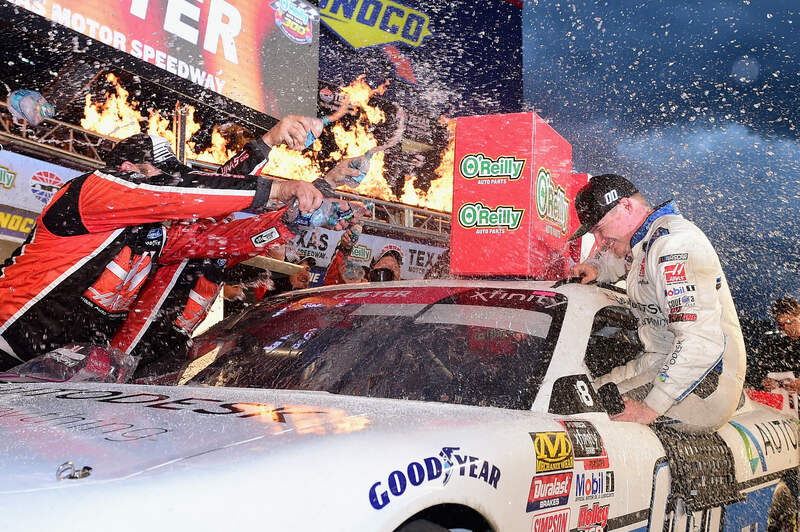 Cole Custer wins stage two in the Xfinity race at Texas! The rest of the field heads for the pits. John Hunter Nemechek wins that race off pit road with a two tire stop. Bell and Sadler will lead them to the starting line. Green, Bell gets the jump on Sadler. Brandon Jones gets loose on the bottom. He skates up the track and collects Michael Annett. No contact for Jones, Annett tags the wall lightly. Green, Bell gets the jump once again. Sadler slots in 2nd. Tifft pinches Spencer Gallagher. Gallagher nearly spins but he collects it. Lap 115, Bobby Earnhardt has caught the wall. He heads to the pit lane under green. Lap 126, Ryan Truex has caught the wall. He’s slow off turn two and the caution is out. Most of the leaders head for the pit lane. Bell is first in. Bell and Hemric each have a 13.3 second stop, Hemric nips bell at the pit exit. No tires for Brandon Jones, he leads them all to the exit line. Cole Custer is handed a pass through penalty. Green, Jones noses ahead on the outside into turn one. Bell gets loose on the bottom again! Hemric runs down Jones and retakes the lead. Bell spent the entire race climbing back to the front and he just did the exact same thing that got him in that position to begin with. Lap 133, Austin Cindric can’t hold it on the bottom. The front end washes up and he tags Christopher Bell! Bell is around, he slams the outside wall with the drivers side door. Both of these drivers are in a playoff race. Bell is done for the day! Green, Hemric spins his tires as Tifft is all over his bumper. That stacks up the inside line. Allgaier is even with Hemric. Hemric gets loose on the bottom in turn three, Allgaier noses ahead off turn four but Hemric is hanging with him. Wreck behind them! Jones couldn’t hold the bottom. He skated up the track and collected his teammate, Ryan Preece. Green, Allgaier gets the jump, he noses ahead on the outside into turn one. Hemric gets a huge run off turn two, he pulls even into turn three. They’re racing hard for the lead. Hemric side drafts him then pulls to the bottom to get away from Allgaier. Hemric takes the lead. Lap 148, Joey Gase is in the wall. The caution is back out. Green, Hemric and Allgaier remain side by side. They trade side drafts down the back stretch. Hemric wiggles off turn four, Allgaier drives by on the outside. 27 to go, John Hunter Nemechek is coming to the front. he drives under Hemric to take 2nd. Hemric clips the wall moments later, he continues. 18 to go, lap cars are ahead of Allgaier and his front end washes up the track. Nemechek is on the gas behind him. Nemechek looks to the inside and he completes the pass in turn one. 13 to go, Ryan Reed is around down the back stretch. The caution is out. The leaders hit pit road! Nemechek is first in and first off. Nemechek will restart in 6th. Green, Custer and Reddick are even into turn one. Nemechek makes it three wide into turn three, he takes 3rd. They spin behind them. Lee skates up the track and clipped Hemric, they both went around. Green, Reddick gets a huge push from Elliott Sadler on the bottom. That was timed, Reddick had his hand out the window to tell Sadler when to start going. 1 to go, Cole Custer is there! He’s on his bumper off turn two. Custer looks low off the corner. They slam doors down the back stretch! Cole Custer leads into turn three! 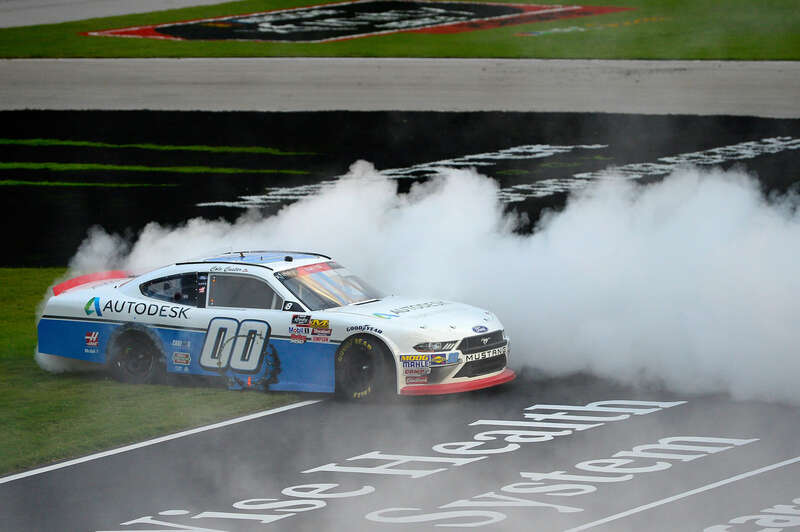 Cole Custer wins at Texas Motor Speedway! 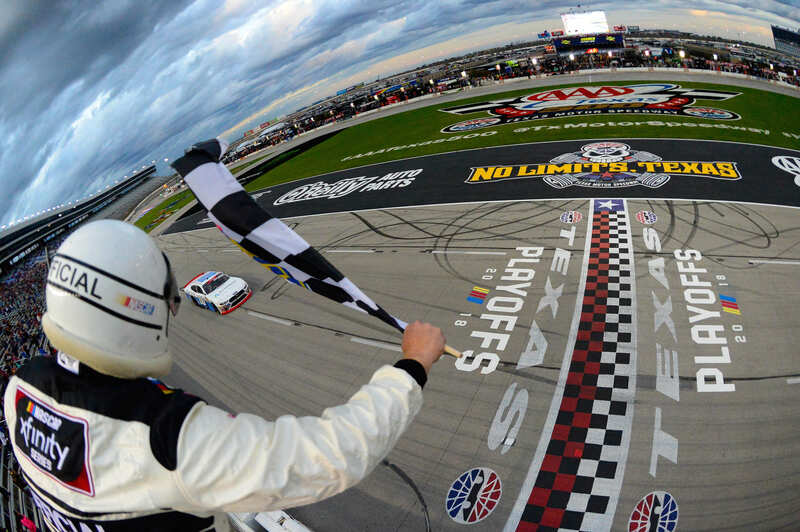 View full Texas Motor Speedway Xfinity race results results below.